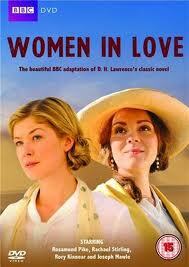 A BBC4 television adaptation of the two DH Lawrence novels The Rainbow and Women In Love, although named solely after the latter, the Women In Love DVD was one I had been looking forward to delving into, mainly due to the presence of such luminous actresses as Rachael Stirling, Rosamund Pike and Saskia Reeves. Imagine my surprise, and indeed pleasure to a certain degree, to find that naked male wrestling was also part of the bargain in this William Ivory-directed two-parter. Centred on the lives and loves of the two Brangwen sisters, Guthrun and Ursula, as they react against the staid lives of their parents with stridently independent action, yet each end up in relationships with men that are endlessly complicated, not least by the feelings between those two men, Gerald Crich and Rupert Birkin. The first part dealt with these lives individually in England and only slowly brought them together, leaving much of the second half to take place in the Southern African diamond mines and deserts (replacing the Tyrolean Alps of the original) where the partnerships literally reached boiling point. I think I preferred the first half, not least because it was simply gorgeously shot. Guthrun’s dicing with social ruin, delicately portrayed by Pike with a fragility to her performance that isn’t always apparent, was given a most expressionistic treatment which floated past yet still somehow lingered. And Ursula’s determination to be true to her heart was given great sensuality by Stirling, a fierce passion that could scarcely be resisted. The earthier struggles of their parents to maintain fire in the marital bed were given intriguing life by Saskia Reeves and Ben Daniels, perhaps a little young in casting but superbly talented with it. The introduction of the men, or rather their relationships, shifted the focus away from the broader social changes that everyone was dealing with to the intimate interpersonal interactions between lovers with all the baggage they bring with them. Rory Kinnear made a great impression as Birkin, caught in a spiritual crisis as he grappled with his sexual orientation, and Joseph Mawle’s handsome Crich, haunted by the death of his sister and his wartime experiences, exerted his masculine spell over all and sundry, having his own sweaty grapple with Birkin on a sun-kissed beach. In the end, it was this relationship that I found most compelling, the Brangwen sisters were almost incidental but the forceful quality of Pike and Stirling meant they could never be forgotten for long. Perhaps a little self-consciously arty for some tastes, I’d say that Women In Love pulls it off extremely well in creating a piece of television that is engaging and aptly emotional, yet simultaneously a gorgeous piece of art with it. Highly recommended.